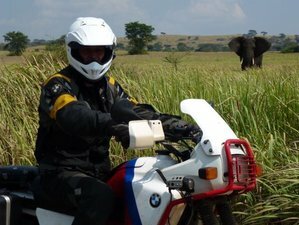 Motorcycle Adventures Uganda provides you once-in-a-lifetime opportunities to explore Uganda on BMW. You will find beautiful roads, explore Lake Mburo National Park, and have a wonderful sightseeing tour. This tour is designed for you to create lifelong memories in Uganda. During the tour, you will also do some safaris on a bike that will keep you coming back for more. Enjoy the ride! It's an all camping tour. Clean bathrooms and toilets are always available for your ease. Today is your arrival day. Uganda Motorcycle Adventure will pick you up at the airport. Stay overnight in Kampala. You will ride from Kampala to Murchison Falls. You will also enjoy a sunset cruise. Today you will have morning safari, ride to a waterfall, and visit rhino sanctuary. You will ride from Murchison Falls to Kampala. Stay overnight in Kampala. You will ride to Lake Bunonyi to do island exploration, mountain rides, and optional gorilla trekking. Today you will have morning safari to see tree-climbing lions. You will enjoy early morning ride to Lake Mburo National Park. Today you will explore Lake Mburo National Park. It is your last day riding in Uganda. You will have a sightseeing tour around Kampala. Today is the departure day. During this motorcycle tour, you will visit Murchison National Park, a rhino sanctuary, Queen Elizabeth National Park, and Lake Mburo National Park. During the tour, you will visit and ride to several places in Uganda including Lake Mburo National Park, Murchison Falls, Lake Bunonyi, and Queen Elizabeth National Park. You will be served daily meals. Uganda Motorcycle Adventure can offer you vegetarian and regular food. Please book your flight to arrive at Entebbe International Airport (EBB). Uganda Motorcycle Adventure offers exciting guided tours of Uganda with the top of the line motorcycles. If you desire a hotel room, it can be arranged at an extra cost.